In 10 Things Lead Magnets that Convert Have in Common, we discussed the winning attributes each lead magnet should contain to get you more subscribers and customers. While adding these elements increases your chances of people subscribing, there is still one issue to overcome: how do you convince them it’s even worth downloading in the first place? It all starts by choosing the perfect lead magnet topic! Before you can create the perfect #leadmagnet that converts, you need to find the PERFECT lead magnet topic! Here are 5 steps to finding the right topic for your #business. Your lead magnet topic has to be well-suited to your audience. While something that’s routinely covered on your competitors’ blogs and websites, or that your prospects already know about would be safe, it won’t win you any long-lasting and high-converting subscribers. Ultimately, prospects need to find real value in your lead magnet if you want to see a major return on it. And that means providing a unique solution to their pain. Here’s a step-by-step guide on how to choose the perfect topic for your lead magnet. For some of you, finding the perfect ‘topic’ for your lead magnet won’t require much work at all. This will be the case if you’re giving away something like a demo of your one and only product or you have a pre-configured toolkit you know is in high demand. For the rest of you, choosing the perfect topic for your lead generation efforts so you can build your email list will take some more work. Let’s walk you through this step by step. In the post 7 Awesome Lead Magnet Ideas to Grow Your Email List, we discussed the seven types of lead magnets you could create for your website. What is the most natural format for the kind of content you want to offer? Even video has a variety of file types it can be presented in. 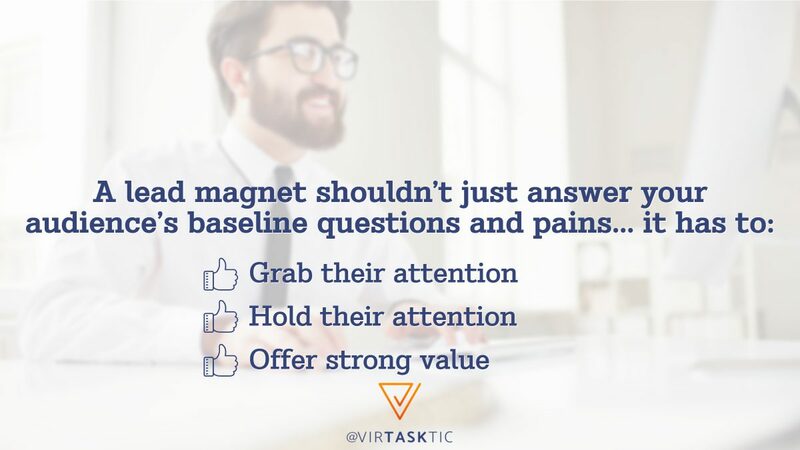 Before you think about the next two questions, narrow down your choices based on the kind of lead magnet you want to make. What is the best form of learning for your audience? By now, you should have a clear idea of who your target audience is. Who they are? What does their day look like? How much time are they willing to give you? Think about what would happen if you put a 30-page ebook into the hands of a CEO or a busy stay-at-home parent. Sure, it might get downloaded, but do you think they’d have the time to read it and, further, consider how your business could play a future role in their life? Probably not. So, develop your lead magnet in a form that they can easily consume. What are your strengths in terms of creating content? You’ll need to be realistic about your own strengths as a content creator. Do you have the time or skill to conduct interviews with a former client? Are you able to take that data and craft it into an interesting story or do you have someone on your team that can? And, finally, do you or someone on your team know how to design the case study document itself? If the format becomes problematic because of your or your team’s limitations, consider a different one altogether. Sometimes the answer to what you should create is right in front of your face – you just need to look at your data! Website most popular pages: This will tip you off to any topics that resonate particularly well with your users. Top landing pages: The very first page a visitor steps onto is a “landing” page. A high number of visitors attracted to that page from search and from referral sources is a good sign there’s something of value there. Most successful blog posts: Which posts receive the most visits, have the longest times on site, and see the most user engagements (likes, shares, comments)? Be sure to measure which posts lead to the most newsletter subscriptions, too. You can get a good sense for which topics are the most valuable if they’re motivating visitors to take action. Newsletter or Email clicks: Don’t forget about your newsletter or broadcast email content. Your email marketing platform should tell you which links receive the most click-throughs. Social media posts: The same goes for social media content. Review the stats regularly to see if there are certain topics people gravitate to (even if the links go to other websites). External sources: Are there forums and groups online related to your particular industry? Spend some time there to get a sense for what your end users are talking about. What interests them? What do they need? What’s the trending news? Sites like Quora are a great place to see what information your audience is looking for answers on. There is a lot you can take away from the hard facts, so make sure this is one of your first stops in determining a topic for your lead magnet. Also, keep an eye out for large batches of content you’ve already created that have done well. Many companies are able to repurpose or bundle all that valuable content into a single lead magnet. They already know the interest is there, so why not give it to users in a more convenient format? You probably have a good sense of what’s currently working well on your site, but is that enough? What if there are other topics your audience is interested in, but you’ve only grazed the surface? You can do a keyword review to find any topics or searches that your audience is doing that you may be missing out on. 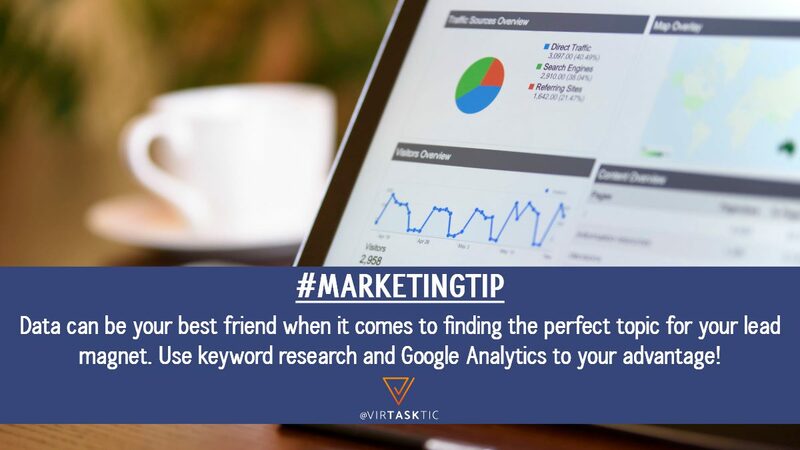 To start, use a keyword research tool like KWFinder or SERPs. Enter a main keyword of focus that is relevant to the lead magnet topic you’re considering. Look at how many monthly searches are actually being done for any search term or topic you’re interested in. Is it a number you’d be happy to work with? Think about how 10 monthly searches for a topic like “Essential Ways to Train Your Cat to Walk on a Leash” would translate in terms of lead generation. It’s important to pay attention to what the data tells you here. You don’t necessarily want the most searched for keywords and topics – but you do want to ensure that there are enough inquiries to make it worthwhile. Don’t be afraid to look at what your competition is doing in the way of lead magnets. Looking at businesses that have been established longer than yours and likely have greater insight into the space than you might currently have can be very beneficial. Doing this should give you a good gauge of what interests your audience. Now, ask yourself: where are they excelling? To answer this, look at the topics that are the most popular in terms of views, clicks, shares, and comments. When an audience responds, you know you’ve successfully gotten their attention. If the competition doesn’t currently offer a lead magnet, then this is a great time to swoop in and provide something to your shared audience that they haven’t. And if they do, be sure to find something of greater or equal value on a different subject you can offer. All the research you do above is going to lead you to a fairly generic topic for your lead magnet. There’s nothing wrong with that, but you must consider that a starting point. Google’s auto-populate search feature works well, too. Just go to search, start typing in your lead magnet topic, and watch as Google gives you relevant and popular suggestions for topics. This is especially helpful if you need a topic that’s more specific (which is ideal). So, rather than write a white paper about “Tax Preparation Tips”, Google might inspire you to pursue stronger topics like “Tax Preparation for Freelancers” or “Tax Preparation When You Live Abroad”. When crafting your perfect lead magnet topic from the research above, don’t forget about the value piece. If you want to boost the number of subscribers, and eventually sales, you get from your lead magnet, then you need to solve problems. If you’re interested in seeing examples of how to do this, check out 21 inspiring lead magnet examples. These examples will help inspire you and get you on track to developing the perfect lead magnet topic so you can create the perfect lead magnet that converts! Taking the right steps to find the perfect lead magnet topic will lend to you building your email list and ramping up your lead generation efforts so you can grow your business.